Wonderland is a beautiful game from Gamesys that is worth discovering. In fact, until last June it was practically unknown to many players since it’s an exclusive slot to Tropicana Casino. But, things changed quickly after Kim Seib won a $197,000 jackpot before going to work! 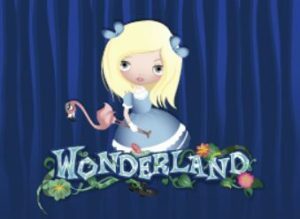 Now, Wonderland is one of the most sorted after games online and the jackpot climbs rapidly. So, if you’re considering playing it here’s a few things you should know about this popular video slot. Additionally, you might want to read our casino review before signing up to Tropicana since we’ve negotiated an exclusive bonus for our readers. So, don’t miss out! Type: Video Slot with 2 Progressive Jackpots. Min - Max Bet: $1 up to $50 a spin. Feature: Multiple pick and click bonus games and instant coin win. How to trigger the bonus features of Wonderland video slot? First and foremost, it’s important to know that you don’t need to max bet in order to win the jackpot. Also, its worth mentioning that you can win the jackpot in any of the 4 pick and click bonus games. Which means, you can win the jackpot if you Paint all of the roses red before the Queen appears, turn the Joker Card in The Queen’s Court, pick 5 hedgehogs with gold stars in the croquet game or pick the right cake at the Mad Hatters Tea Party. The pick and click bonus games are all activated with 3 or more “bonus” symbols. Plus, the game you’ll play is revealed by the secret doors you’ll open in the mini-game. In case you wondered, the last time the jackpot was won it was with the “paint the roses” bonus feature. But, really it could happen in any of the mini-games! Why should you play Wonderland video slot? First, you can play it for free when claiming the Tropicana Casino sign-up bonus. Not to mention, that if you want to claim a deposit bonus they have one for you as well. In either case, its worth mentioning that the game activity on Wonderland contributes at 100% towards the wagering requirements of a bonus. But also, you can accumulate loyalty points whilst playing this game. Second, it’s really worth playing this slot especially if the jackpot is at over $150,000 since its probably about to fall. Which means you could be on the verge of changing your life with a spin! Thirdly, the pick and click bonus games are well-designed and bring a nice whimsical element to the game. Finally, the game gives you the option to win 2 jackpots so it has a flexibility that very little games offer.